Note. This article applies only to Customer Care Portal users. 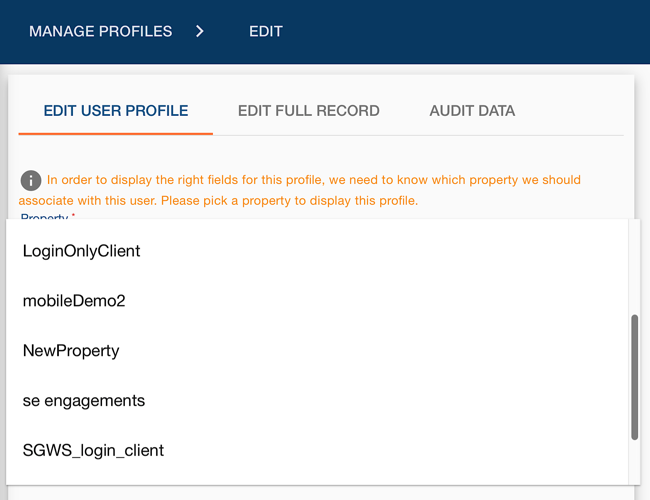 When you create a new user profile, a login client is automatically selected for you, and there’s no way to avoid that: although you can change the default selection (assuming you have more than one login client), you can’t leave the Property field blank. You must specify a login client in order to create and save a user profile using the Customer Care Portal. Note. Yes, in the Customer Care Portal the login client field is labeled Property. However, if you look in the schema, you won’t find an attribute named Property. Instead, the Customer Care Portal’s Property setting maps to the clients.clientIDattribute. The schema also displays the login client by client ID (e.g., c5ukftq8n6fene4mgw6bvbhb5vj87rps) rather than by client name (e.g., EMEA Login Client). In case you’re wondering, if you only have a single login client then that client will automatically be selected and assigned to the user when creating a new user profile. But suppose you have more than one client (for example, clients A, B, and C). By default, the Customer Care Portal automatically assigns the first client in the list (Client A) when new profiles are created. However, suppose you create a new profile and change the user’s Property to Client B. The next time you create a profile Client B, the last login client assigned to a user, will be selected and assigned to the user. Note. Does it matter which login client you assign to a user? It might: after all, API clients are often configured differently from another. In fact, you typically won’t have multiple API clients unless you need multiple API clients. That suggests that yes, it can matter which API client you assign to a user. The moral of that story? If your API clients use different email verification and password recovery URLs, changing the Property attribute helps ensure that activities such as these take place at a specific web site.